One thing I'm learning about making canvases that serve as photo frames, it is really tough to do one for both a boy and a girl together. I had a request to make one for a gift that would have a photo of a little girl about 1 year old and a boy about 4 or 5 years old. Pink and blue was the suggested color combo and she wanted the design to completely wrap the canvas. I used the children's initials. The little girl's part was easy, some flowers and rhinestones, jewels buttons, and lace. Piece of cake. A boy is much tougher for me. Adding some citron green would keep the pink from overtaking things I reasoned. 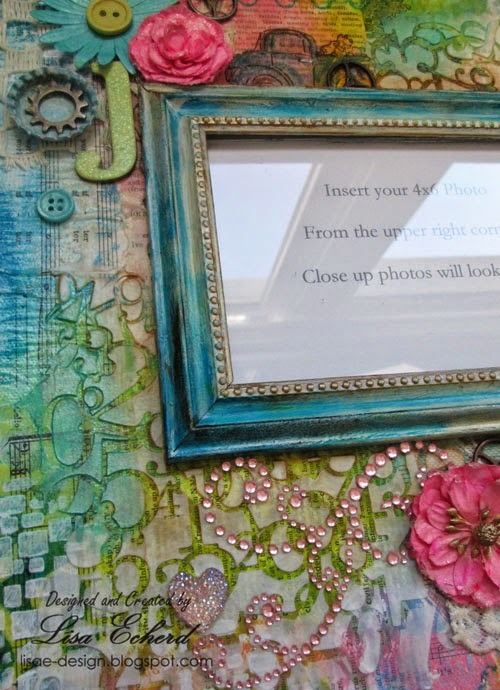 I also used some Tim Holtz gears. The little boy's grandfather is a mechanic and I'd been asked to incorporate a car. Stampin' Up! 's Loads of Love has a truck that I stamped at the top of the frame. I kind of wish I hadn't colored it in, but I needed a bit more blue. Adding the flair was a last minute decision. 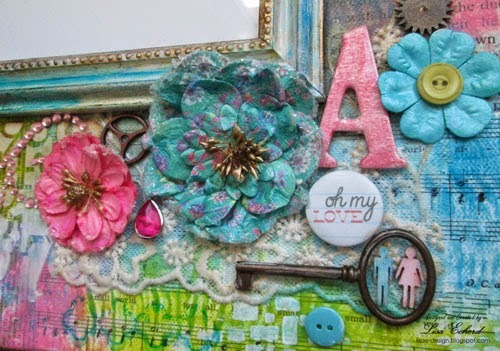 That and the little boy and girl in the key are my favorite embellishments here. There is also sheet music from "It's a small world." My understanding is that the grandmother who will use the canvas was delighted. Personally I think next time I would do a multicolor one with a lot of white space in the background. Over the weekend, I made a video of my work area and my canvases currently in my Etsy shop. There is a multcolor one with lots of white space. My shop is Lovely Layers Art. Thanks for stopping by today! 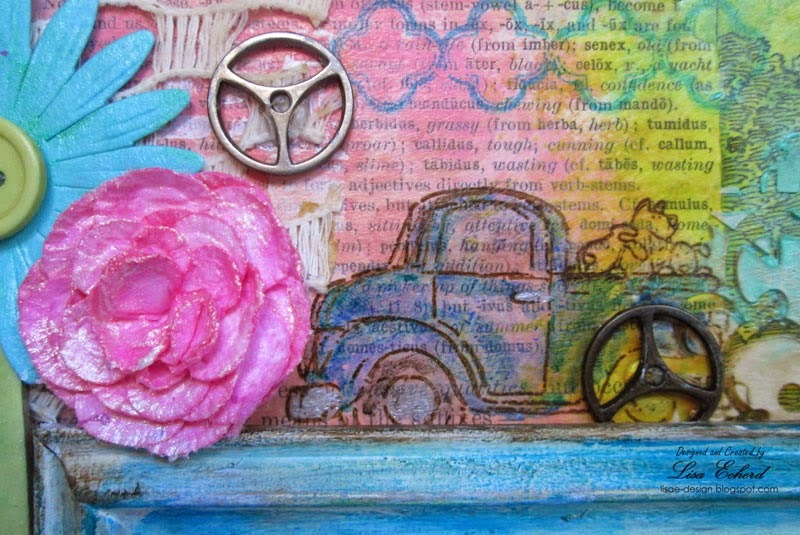 I have a scrapbooking process video for you tomorrow or Wednesday. 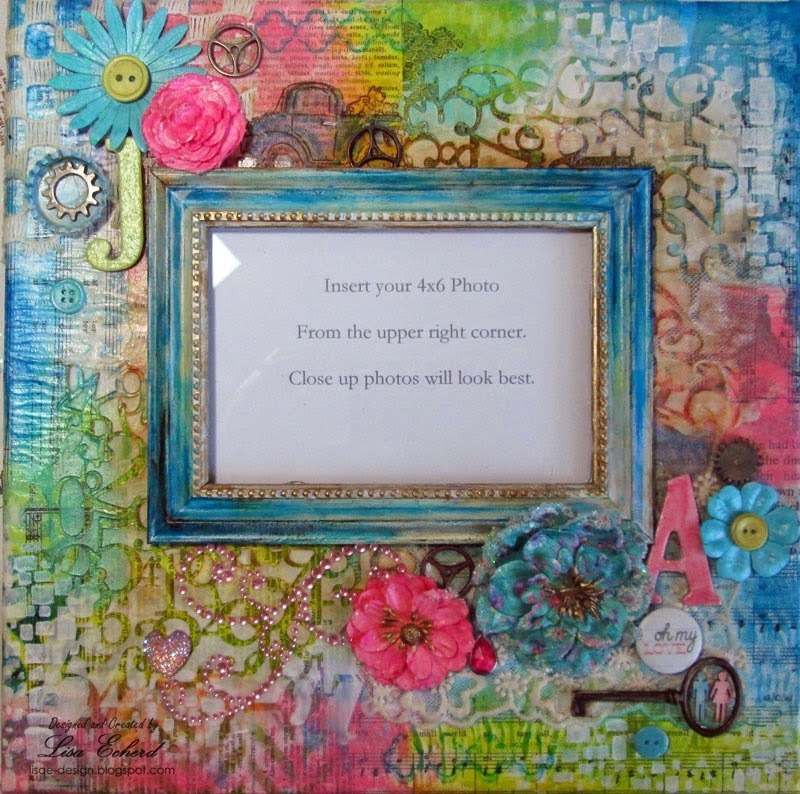 Beautiful canvases, Lisa! So happy you opened your Etsy shop - and that people are already snapping up your wonderful creations. Good luck with it! Thanks for sharing. And I think your next online class needs to be on making these beauties! I especially love the 4 seasons one.